Book a package and join the 188 others who’ve received 100% off their flights this year! Earn Orbucks instantly on every package with Orbitz Rewards! Save more by booking your flight + hotel together! Earn up to 10% back with the Orbitz Rewards Visa Card. Hartsfield-Jackson Atlanta Intl. - O'Hare Intl. Liberty Intl. - O'Hare Intl. I liked that it was attached to the Illinois Center via an underground tunnel. This made it comfortable for walking the long distance to the parking lot. I refused to pay $69 a day to park my car at the Hyatt. Good location. Sky Lobby is slightly inconvenient as far as needing 2 elevators to get to rooms. Breakfast and manager reception are both great but very busy. 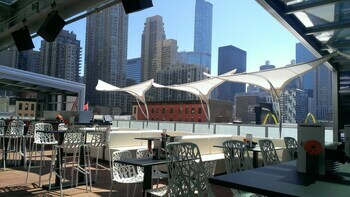 Great location, classy old time Chicago vibe and fantastic lake view. I’ve enjoyed my stay each time, although the radiator needed to be bled as it was clanging frequently. I’d have loved a mini fridge in the room. Also, the website says on-site parking and that turned out to be incorrect. Otherwise it was awesome. Always a pleasure. Tourists flock to Chicago during spring and summer, when Chicagoans emerge from hibernation into outdoor cafes, legendary sports stadiums and the city's gorgeous parks for music, food and cultural festivals including the Taste of Chicago and Lollapalooza. If a Chicago vacation happens during the winter, pack a down coat and take advantage of off-peak rates at downtown Chicago hotels. The city's public transportation is among the best in the nation, making it easy to travel to museums, bars, restaurants, landmarks and even far-flung locations in the suburbs. Shake up your Sunday brunch with the bottomless mimosas and drag shows at Kit Kat Lounge, Boys Town's favorite martini bar and lounge. If you're planning to visit this famous restaurant, book your reservation at least two months in advance. If you do score a table, don't be discouraged if you can't spot the restaurant immediately. It's in a grey brick storefront with no sign. Looking for an offbeat place for cocktails in one of Chicago's hippest neighborhoods? 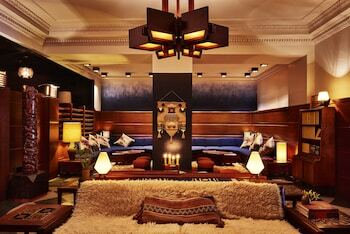 Consider the Bedford in Wicker Park, located in a former bank building. Imbibe old-school cocktails in the actual vault, which is dotted by safe deposit boxes. For a leisurely lesson on Chicago's architecture, catch a boat cruise from Navy Pier or at the bottom of the Wrigley Building. For great people watching and impressive skyline views, hit Oak Street Beach, where singles flock to play volleyball and sunbathe. Families stick to Montrose and Loyola beaches a little further north, which are a lot less crowded and pose better chances for finding a parking spot. You'll savor every second in fascinating Chicago. The experts at Orbitz can help you get your escape underway by linking up first-rate flights and hotels. It's easy to save by packaging your bookings. Pick out your preferred airfares, hotels, rental cars and experiences and you can save up to $857*! You'll have no less than 500,000 accommodations across the world and 500 airlines to choose from. With such fantastic flexibility, tailoring your dream getaway is a piece of cake. Lock in a package deal that fits in with you and your distinctive style. There are unlimited possible flight options, room types and jaw-dropping experiences just a few clicks away. Rewards programs are a dime a dozen. But what would life be like without those perks and bonus savings? We've developed a simple program that will reward you quick! To gain instant Orbucks, just keep booking with us! Also, just book four nights for gold membership and 12 nights for platinum membership. So, what does that get you? Well, you'll have special perks, like complimentary breakfast, Wi-Fi and more, at Orbitz Rewards VIP Hotels. And how do you redeem your Orbucks? Simple — use your Orbitz Rewards points on your following booking. Sometimes it's great to travel without a plan, but even the most spontaneous travelers ought to have a basic understanding of where Chicago is. It is about 180 miles northeast of Illinois' capital, Springfield. Chicago is also 19 miles northwest of East Chicago. With plenty of things to do in this area of Illinois, it's easy to understand why 2,700,000 people reside here. So, what's the first stop? You'd be nuts to leave out the Art Institute of Chicago and Willis Tower. While you're checking out iconic attractions, why not take a look at the McCormick Place and the University of Illinois Chicago too? Navy Pier and the Lincoln Park Zoo are just a few of the interesting attractions in the area. These aren't for you? Don't fret — you're flush with choice here. Other fine options are Lincoln Park and the Chicago Cultural Center. An essential part of the local infrastructure, Millennium Park provides residents and visitors with a green space for relaxation and recreation. Enjoy a walk or take off your shoes and feel the lush grass beneath your feet. Want to keep the good times rolling? Look up at the skyline and appreciate John Hancock Center, one of the most impressive buildings. See if it's possible to climb to the top and watch the world go by from way above. But wait, that's not all! If you're looking to get your bearings, be sure to make the trip up to Skydeck Ledge. Not only will you be privy to panoramic views of the area, it also makes for the perfect place to snap a selfie or two. Take your travel lust further by checking out car rentals in Chicago. It doesn't matter where you go or what you're wanting to do, Orbitz will help you find a rental that satisfies your adventurous spirit. You can go right from the plane to the car at Midway International Airport. Budget and Avis are both a short distance from arrivals. Consider renting a car from Enterprise at 20 E Randolph St 3Rd Fl. They're right in the heart of the city. If there isn't anything to your taste there, Budget at 214 N Clark St is your next best bet. Book a place to stay and get ready for your big adventure! Orbitz offers as many as 165 hotels in Chicago. 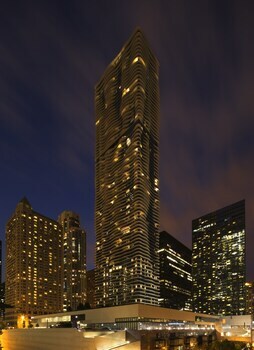 The Waldorf Astoria Chicago is a brilliant choice if you're searching for top-end accommodations. 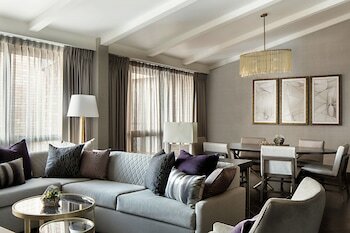 If that's fully booked, check out The Peninsula Chicago. 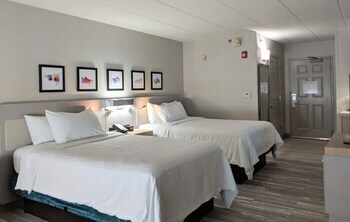 On the other hand, check out the amenities at the Old Chicago Inn or the Urban Holiday Lofts if you're traveling on a stricter budget. 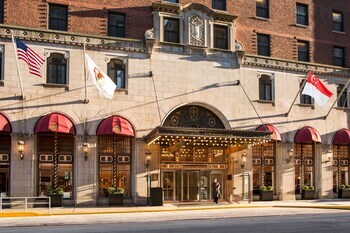 The Langham, Chicago is only 0.6 miles away if you're keen to stay close to the Art Institute of Chicago. 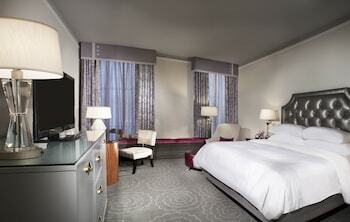 Located 0.5 miles away, the JW Marriott Chicago is practically on the doorstep too! After traveling all the way to Midway International Airport (MDW), you'll just have one more journey to take before you reach your final destination. The terminal is located 9 miles southwest of the downtown area. Once you've spent some time seeing the best of Chicago, world-renowned attractions are on offer right around the corner! Six Flags Great America draws visitors from all nations. North Chicago, about 35 miles from Chicago, is a convenient base when stopping by this unmissable attraction. Canceling or making changes to a booking can often be tricky — but not with us! We don't charge a fee, which will make it a piece of cake.^ Airlines and hotels can have the same policy, so contact them to find out. * Prices reflect the lowest "base rate" found over the next 30 days. Rates are subject to change and may not include taxes and fees, hotel service charges, extra person charges, or incidentals, such as room service. All rates are displayed in USD unless otherwise noted. Converted rates are provided for your convenience. They are based on today's exchange rate, but the hotel will charge you in the local currency.